Place a square of clingfilm over each ramekin, then brush the inside with a little oil. Crack an egg into each ramekin and close the clingfilm around the egg, and cook the parcel for 4 minutes in boiling water. Cut the avocados in half and remove the skin, the stone and some of the flesh in the middle to make room for the egg. 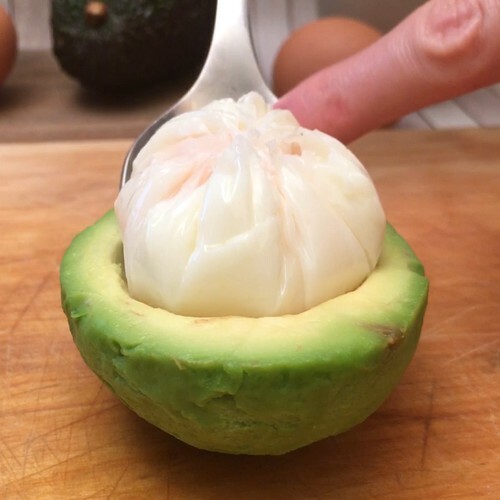 Remove the clingfilm from the eggs and gently place them in the middle of the avocados. Place the other half of the avocados on top and wrap the whole avocado in 3 rashers of bacon. Fry the avocados in a pan for 10-12 minutes, turning frequently to cook all the bacon. Serve hot.